Films and plays by nature portray good and bad as polar opposites, and for this reason the actors personifying them sometimes give the impression that the world is housed by paragons of virtue on the one hand and absolute villains on the other. Reality isn't cast in black-and-white, but the temptation to give into the notion that it is ails our artists and actors. It is for this reason that stars who've refused to lend credence to the good/bad dichotomy are to be lauded. Going by this hence, Anoja Weerasinghe, actress and social activist, is a living testament to what acting should entail. Anoja was born in Kailagoda, Badulla. Although she never received any formal training in her field as a child, she admits straight off that the experiences she went through in her childhood taught her enough and more. Her family had been artistically inclined, moreover, while the intimate bonds they had with their village and temple shaped their innate sensibilities. All this must have helped a lot when Anoja began taking part in stage plays, no doubt. Her childhood had oscillated between Badulla and Moneragala, with her attending schools in both regions and performing items in them. Remembering those days, Anoja relates to me one such item, where she had to act as a Japanese princess and one she performed when she was about five or six. "That was my first experience onstage," she smiles. She took part in her first play when she was 13. The play, "Anduren Eliyata", had won the praise of the Chief Guest (a prominent local politician), but it was what he had to say about Anoja that moved her. "He basically said that he could see a great actress in me, and that he could see me in mainstream films. Now imagine a 13-year-old village girl hearing those words from a politician, and one who regularly visited and resided in Colombo. Naturally, this was BIG news to me!" she laughs. What she gained during all these years, she puts to me quite clearly, was compounded by her interest in the cinema. Back then, when going to the cinema hall was considered a ritual, Anoja would watch films and walk back about four miles ("because there weren't any buses after 6.30 in the evening"). She is correct in implying that it was a ritual, of course, and I wonder: do actors receive their baptism of fire at the theatre, and not (as is supposed) in school? The way Anoja describes how she trudged with her friends to the nearest hall for the latest shows in town affirms that, I suppose, even though she herself doesn't admit it explicitly. I'm sure people have that one film they watch and are awed for the rest of their lives by, and I'm also sure Anoja is no exception. Without any hesitation, she comes out with it: "I remember watching 'Welikathara' quite vividly even today. That was the first Sinhala film shot in Cinemascope, as you know, and at the time we had very few halls, scattered for the most in and around Colombo, which could screen it properly. Not surprisingly, when I saw it, the frame was distorted and the images were projected on the wall." She admits that during these years, she remained fixated on the cinema. "I watched as many Sinhala films as I could, for the most because of the actors but also because of their storylines. This was when Malini Fonseka had becomes a star. After watching her in some films, I became a fan." She adds that whenever she got to see Malini's performances, she would imitate her for days on end. But of course, she was by now a stage actress, not a film star, and because of this she found it difficult to get rid of a penchant to overemphasise. "I still hadn't grasped the essence of film-acting, which was CLEAN DIFFERENT to the cinema in terms of acting. Not surprisingly, I used to highlight every emotion, even when I was initiated into the cinema." That initiation came about in 1979, when she acted opposite Malini Fonseka in "Monarathenna" ("My first real performance was actually in 'Tak Tik Tuk' some time back, which lasted for about 30 seconds"), which had marked the first ("and last," she emphasises with a smile) time she made the mistake of blurring the distinction between cinema and theatre. "Basically, I overacted. My co-stars could have got angry at me for this, when it was clear that I committing the mistake again and again, but they didn't. Malini akka and Daisy akka (Rukmani Devi) instead comforted and corrected me. They tutored me on the mechanics of acting in front of a camera. I found that very helpful, and to this date I am grateful. They never made me feel as though I were an outsider or a newcomer." Anoja has had her fair share of both commercial and non-commercial films, but it'd be wrong of me not to say that we remember and admire her greatly for those performances where she acted free of frill and seriously. She rattles off a list here, but because of spatial constraints I can't include them all here. Suffice it to say that they all show her at her best, depicting the sort of female protagonist the Sinhala cinema epitomised in the 1980s, free of the black/white distinction I alluded to before. When talking about her in this regard, however, there's no way I can evade talking about D. B. Nihalsinghe. "How on earth could I have known that about a decade after watching 'Welikathara', I'd end up acting under him?" she smiles. "He was the cameraman for Professor Sunil Ariyaratne's film 'Muhudu Lihini', in which I acted, and he saw my performance." Apparently when her name was suggested as the female lead in Nihalsinghe's adaptation of Arawwala Nandimithra's "Maldeniye Simion", both author and producer had been sceptical. "They were worried about how well I could fit in a serious setting when all they'd seen of me, by that time, was a crooning lover running from one bush to another in commercial films. But Nihalsinghe was adamant. He wanted me for that role, and if he couldn't have me, he wouldn't make the film." They relented in the end, thankfully, and she took part in what would be later regarded as one of her finest performances. I haven't seen "Maldeniye Simion", nor have I seen "Keli Madala" (also directed by Nihalsinghe and featuring Anoja), unfortunately, so I can't comment beyond this. But Anoja's fond reminiscences about the director merit mention. 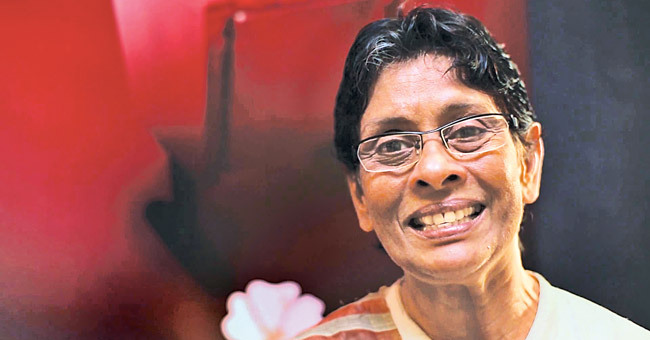 "I was like a ball of clay under D. B. Nihalsinghe's direction. He moulded me, in other words, and to this day I still can't understand how I played for him in those two films. He's so soft-spoken that when he instructs me, the other actor beside me can't hear him. In a very subtle manner, he drew the characters I played for him into my soul. In the end, I acted with the likes of Joe Abeywickrama, Swarna Mallawarachchi, Ravindra Randeniya, thanks to him. He was and remains my guru." "Maldeniye Simion" got for Anoja an award at the New Delhi International Film Festival, the first for a Sri Lankan. "People think that the competition was centred on South Asia, but this isn't true. There were actors and actresses not only from Asia, but from the rest of the world as well." In any case, her winning the award led to the next chapter in her career, when Lever Brothers, together with some friends of hers, financed a studentship at the London Academy of Music and Dramatic Art (LAMDA). At this point she tells me that although we draw a boundary between actors who're formally trained and those who're not, that boundary is actually a fiction. "Look at Gamini Fonseka and Joe Abeywickrama. They didn't 'study 'acting as such. But they learnt their trade, whether at school or in their village. To me, hence, this distinction people talk about is meaningless, because even though we were never actors professionally at the outset, we knew our trade by instinct." To wrap things up, I end this little piece by her reminiscences in another film she looks back at fondly: Parakrama Niriella's "Siri Medura". "Back then, I didn't really know what film-acting entailed. This bothered me particularly in the final sequence of that film, when I had to give into hysterics after shooting and killing the main character. This involved a lot of footage, which necessitated a series of rehearsals and a perfect final take. When Parakrama aiya asked me to do a rehearsal, however, I was lost. How could I act out when there was nothing in my mind? I told Parakrama aiya to go for the take, hoping that something would 'come out'. What happened next? I don't really know, but when the camera started rolling, I began asserting my natural self. This led in turn to a barrage of hysterics which continued until the very end shot. That first take was taken in. Then and there." It is to Anoja's credit that there are very few actors, even veteran ones, who can act and come out unscathed this way. Of course, she offers a qualifier here: "If I were to do this sequence again, I don't think I can comply!" The confession of a truly instinct-driven actor, I believe, and one because of whom our cultural firmament has become richer and richer by the decade.